BFHA members are our biggest asset - BFHA is an entirely volunteer organization so we always need new and existing members to volunteer for board positions. 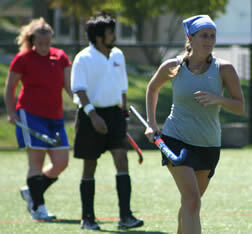 Baltimore Field Hockey Association (BFHA) holds an Annual General Meeting (AGM) each fall, at the conclusion of the Fall League (late October/early November). To be able to play in the Fall championship games, all BFHA members must attend the meeting. The AGM is held at the site of Fall League play; we generally hold part one of the meeting, break to play the championship and consolation game, and then reconvene after conclusion of play, to continue with the meeting. BFHA members bring food to share for post-play as we continue the meeting. During the AGM, the BFHA President conducts the meeting, going over new and old business for all aspects of BFHA - the leagues, tournaments, etc. Each BFHA board member gives a board report on his/her area such as Fall League, Summer League, Beach Bash, etc. The AGM is also a chance to have your voice heard by the BFHA board and membership - maybe you have a great idea you want to share or have something to discuss. In addition to discussing old and new business, the AGM is where BFHA elects its board each year. BFHA has a number of board positions; we are an entirely volunteer organization so we need new and existing members to volunteer for board positions. Volunteering for the BFHA board is a great way to help out BFHA, to meet new people, and a chance to have your voice heard and make a difference. We are always looking for new board members! You can nominate yourself or someone can nominate you for a position. The nomination, election and confirmation process all happens during the AGM. Throughout the year, generally quarterly, the elected BFHA board meets to discuss old and new business. These meetings generally happen at a board members house or a restaurant. The board meetings offer the opportunity for board members to plan for upcoming events, tournaments, and league play. Board members prepare and present board reports for the meeting, that are shared with the rest of the board. Because BFHA is entirely a volunteer organization, we rely on our board members and membership to run the organization. While you may not have joined the board during the Annual General Meeting in the fall, perhaps because you were too shy, too busy, etc, we still need you! You can volunteer to help out at any time, whether it's arriving early to help set up for a night's play during Summer League, staying to clean up after a tournament, or helping to organize a fundraiser. We're always looking for BFHA members to help out and to provide ways to grow BFHA and its mission of promoting hockey in the Baltimore region. Come join us!